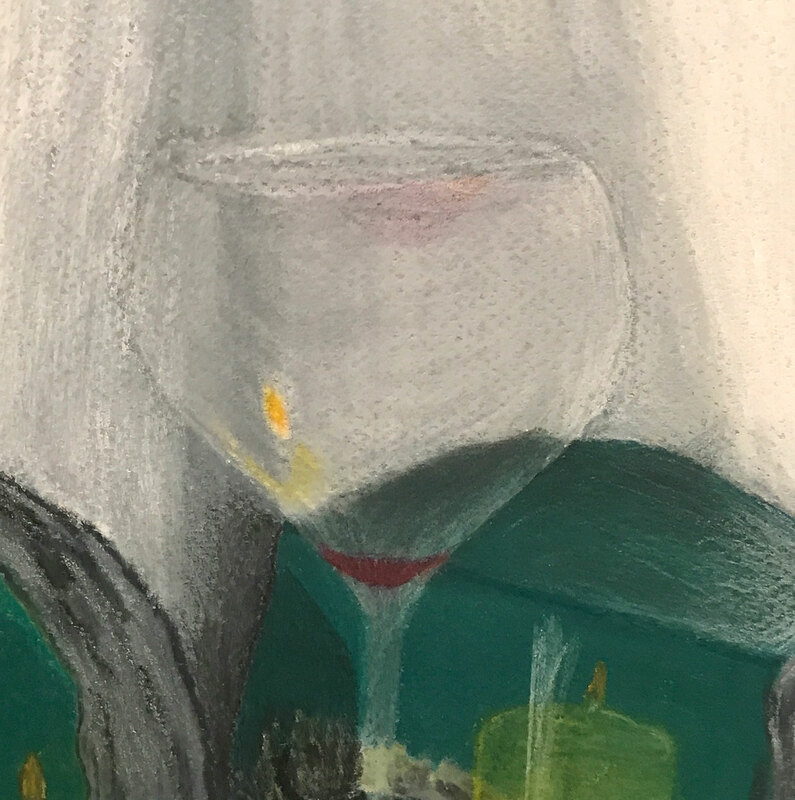 How to draw a glass – seems to be a dance between white, what’s in the glass, and what’s behind it. Reflections – that is hard. I got close to what I was observing, but they’re still not quite right – the rock faces were highly polished which I did not capture at all. 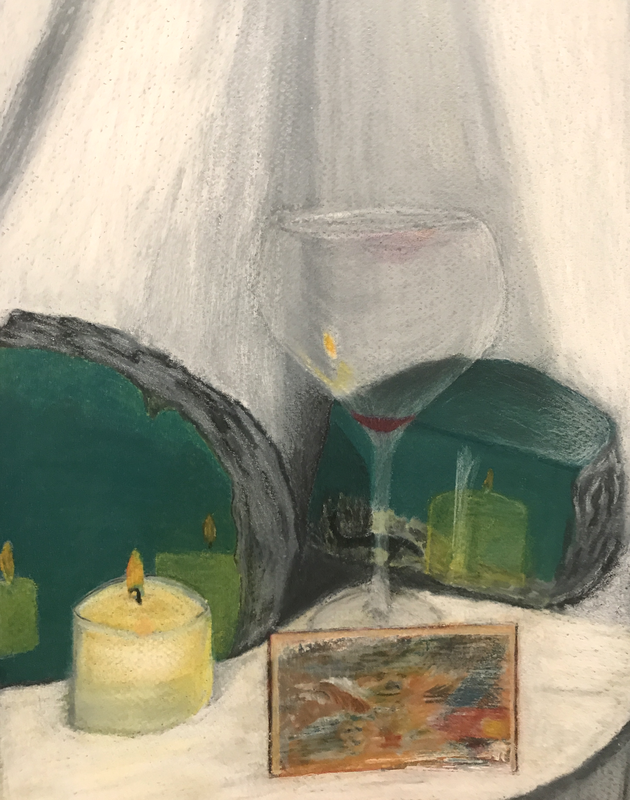 Overall, it’s difficult to describe exactly what I’m learning without rambling, but I can at least say for me, still life is a beneficial study, and I’m glad I watched the course as it got me motivated to give it a try. As for the crayons, I’m starting to like them. In this piece, I experimented more with blending using mineral spirits and tried some (not sure of the term) chipping away at multiple layers leaving some ‘chipped’ areas and back filling others – I did this in the photo in the piece. I think I want to try that with a larger piece and see what happens. 4 responses on "Mick Hart"
I definitely know what you mean when you talk about capturing objects as they “really appear.” Especially when drawing familiar subject matter it’s easy to just fall back on memory and draw either what you think the object “should” look like, or just the most common representation of that object. We all know how to draw the classic, lemon-shaped “eye,” but drawing the eye of someone right in front of you can be quite difficult! To me, this piece feels pretty specific, however, so you’re certainly on the right track! I find it really commendable, too, that you decided to challenge yourself with all of the reflective surfaces in this setup. It would definitely be a tricky undertaking for a beginner, but sometimes when you’re getting frustrated with a new medium I find that it actually helps, on occasion, to dive right into the deep end! It looks like your ambition is starting to pay off, so keep at it! You’re off to a great start Mick! Working with a still life is always hard, especially when you’re starting off. Learning how to translate something 3D, that sitting right in front of you, to something that is a flat, 2D image, takes a lot of practice and persistence. 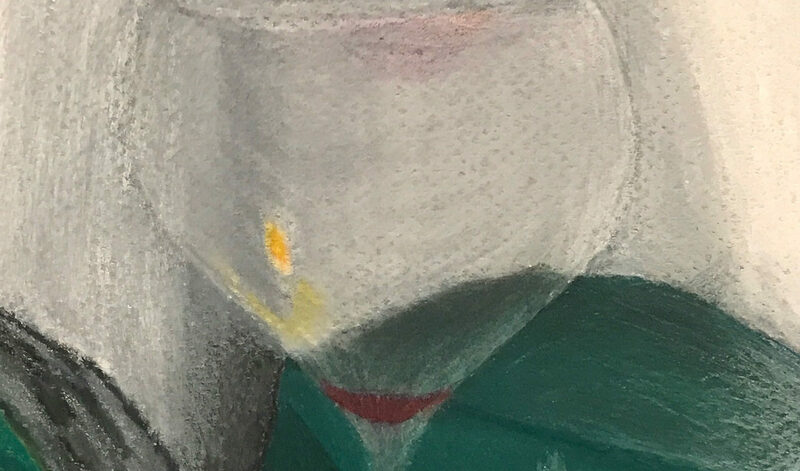 I’d encourage you to move forward by really observing the textures of the objects you’ve chosen, and spending time trying to figure out how your method with the crayon can help further articulate those textures. 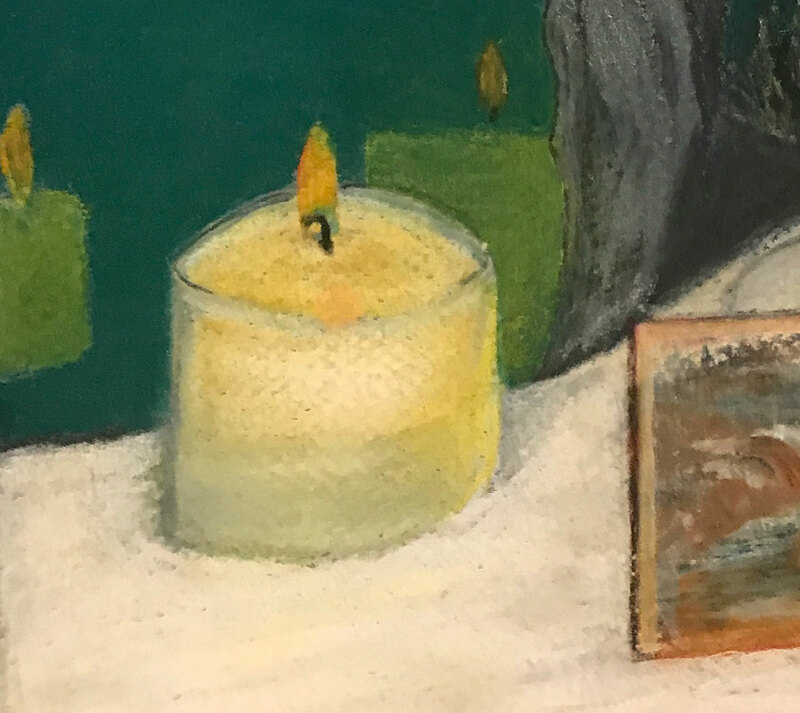 How does the texture of the rock differ from that of the glass, and those from the candle? 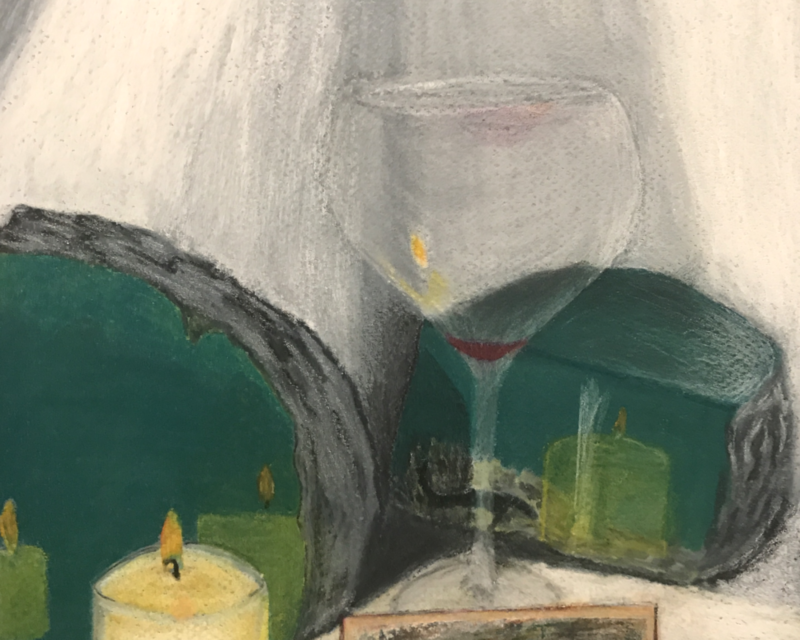 Perhaps a different lighting situation, one that stresses the reflective qualities of the rocks and glass, could help translate those qualities into your piece. The way light reflects off of the glass will be so different than off of the candle! Additionally, don’t be afraid to explore color further. Instead of using the black and white crayon to show shadows and highlights, try using different values of the same color. Perhaps mix complementary colors to develop shadows! If you look at the a super red apple very closely, you’ll notice so many other colors than just red! Even looking at the white walls in a building, often there is no spot of just pure white! In the rock, for example, although your eye may trick you to think the polished surfaces are purely green, take a further look and explore what other colors really do pop up in there! Even in the grey backdrop, I’m sure some of the colors in the objects and around the room find themselves reflected onto the backdrop. You were really successful in the transparent qualities of the glass as well as the reflection of the candle! I love this attention to detail! I encourage you to keep at it! This is a fabulous piece and you’re only going to discover more as you keep making! Thanks for taking time to provide the detailed critique! It was very helpful. It sounds like practicing this still life set up was a really big step for you and that you got something out of it! I definitely want to encourage you to keep it up. I’m going to use this critique to go point by point based on what you’ve written here. Hopefully something I say will stick and be of use to you. Still life (as you’ve already learned) is a great way to study how objects appear. One thing that may help you is to break down the objects you see to their most basic shape/common denominator. The world is made up of essentially four basic shapes: sphere, cube, cone, and cylinder. Everything in the observable universe can be deduced to one of those shapes so keep that in mind. 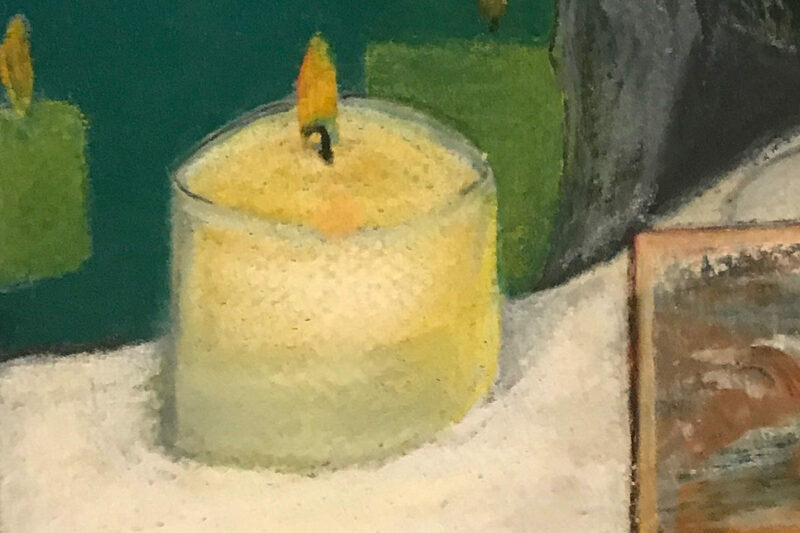 For example, the candle you drew is basically a tiny cylinder. The bowl of the wine glass is basically a sphere with the top cut off attached to a really thin cylinder for the stem. Learning to see this in the things you draw whether it be a car, the human figure or random objects will propel you forward instantly. In terms of laying everything in its proper space, I would take some time to learn perspective drawing on the side. That’s ultimately where you’ll find the solution to your problem because you’ll learn how to create a three dimensional space on a 2D platform. In terms of the shine on the glass, don’t be afraid to use high contrast. Understanding value is key to creating strong focal points and strong color. See what happens when you have a very bold stroke to represent the shine of the glass (or whatever else you want to put high contrast in). I’m also glad you liked the medium you were working in. Keep exploring texture in your pieces to match what you’re drawing. For example understanding the texture and folds of the cloth vs. the clear smooth edge of the wine glass. I hope that all helps! Keep drawing!